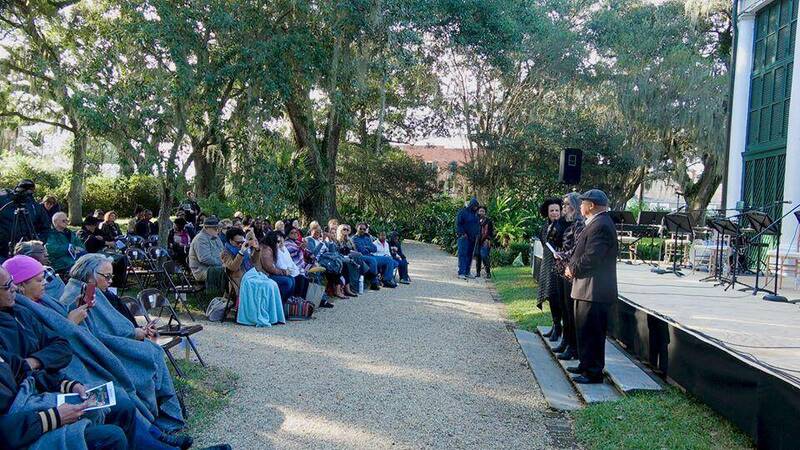 An all-ages audience of more than 150 attended the world premiere reading of Bunk Johnson – Out of the Shadows on Saturday, November 10, 2018, in Louisiana, according to Jayd Buteaux, programs manager at The Shadows. “The feedback from the performance was overwhelmingly positive,” she said. Trumpeter-educator Dwalyn Jackson—a member of the trio that performed the play’s music— said the event made New Iberia proud. “It was a mind-blowing experience for a small town,” Jackson said. Bayeza also directed the November production which featured 10 actors representing Bunk Johnson at three stages in life and the people who crossed his path. Among the actors was former American Idol contestant and New Iberia native Aname Rose (born Saasha Small) playing Bunk’s longtime companion and wife, Maud Balque. The pit band was helmed by University of Chicago keyboardist Shawn Wallace and featured two members of New Iberia’s own Bunk Johnson Brazz Band, trumpeter Dwalyn Jackson and percussionist Andre Rochelle. After the play, the Bunk Johnson Brazz Band led a New Orleans-style second line from the Shadows to the art deco Sliman Theater on Iberia’s East Main Street. There the Brazz Band played tunes from Johnson’s repertoire as well as some modern jazz and traditional brass band music. On the following Monday, Shadows staff busily fielded phone calls and emails asking for the dates of upcoming performances. “We’re hoping to offer performances again in the spring in conjunction with the Bunk Johnson Jazz, Arts, and Heritage Festival,” Buteaux said. That festival is normally scheduled in mid-May; bunkjohnson.com.